A proposal for transforming the 1940s Iberville complex in downtown New Orleans into a denser mixed-income neighborhood, hinges on removal of I-10, an elevated highway, which in the 1960’s replaced Claiborne Avenue, a broad tree-lined boulevard that was then a bustling African-American commercial strip. An article published this week in the New York Times Critic’s Notebook column highlights the project, and the idea, first proposed by the Congress for the New Urbanism, to replace the elevated expressway, with an at-grade urban boulevard. The city received a federal grant of $2 million last October to study the teardown option. o Traffic is adaptable. Urban traffic (i.e., drivers of motor vehicles) is highly adaptable and will divert to the best route available, especially when there is a highly connected grid of streets. When a high‐speed urban freeway is available, traffic is drawn to that corridor due to the higher speeds. In cities that have experienced a freeway removal, either planned or through a catastrophe, traffic has quickly adapted and redistributed itself to other routes. o Economic benefits result from removing elevated freeways. The localized economic harm that has resulted from the Claiborne Expressway is obvious, documented by the low property values and decline that the corridor has experienced since the freeway was constructed. Several compelling recent projects show the great benefit that can result by removing elevated freeways and replacing them with well designed, multimodal urban streets. This entry was posted in Highway Planning, NOLA on April 7, 2011 by OCL. According to the March 23, 2011 Streetsblog , NPR didn’t get it quite right in reporting that Cleveland is replacing a freeway with a tree-lined pedestrian-friendly boulevard a la the Embarcadero in SF or Park East in Milwaukee. Although the elevated freeway is coming down, the ODOT has reportedly nixed a reduction of the speed limit from 50 to 35 mph and the placement of traffic lights and pedestrian crossings – planners say they would add 70 seconds to commuters’ travel time – relegating pedestrians and bicyclists to underground tunnels to reach the park on the shores of Lake Erie. This sounds a lot like Buffalo’s Experience with NYS DOT and the Outer Harbor Expressway that separates Lake Erie from downtown http://oclblog.wordpress.com/2008/09/30/rethinking-i-81-ocls-study-blog-3/. The elevated, limited-access Route 5 restricts access to the lakefront and limits development potential according to opponents, but DOT rejected calls for an at-grade boulevard. This entry was posted in Buffalo, Cleveland, Highway Planning on April 7, 2011 by OCL. What would happen if they took out what was considered a vital traffic artery carrying 168,000 cars per day? Lots! Improved travel time, improved environment, increased property values, more public space, revitalized central business district. 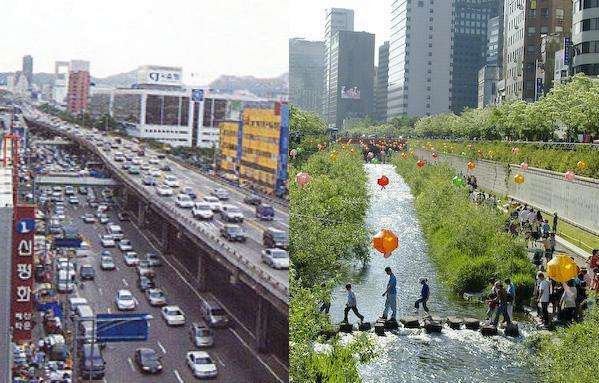 Kamala Rao, MCIP, Transportation Planner in Vancouver, BC, and a Sightline board member, profiles Seoul’s success story of urban highway removal at Sightline Daily. This entry was posted in Highway Planning on April 1, 2011 by OCL.